What equipment do I need to get started with a cat? Cats are often so self-sufficient and simple to look after that it can be easy to overlook the setup required to bring home your new feline friend. When you first bring your cat home, they will most likely spend the first day or so hiding. Often the top of a wardrobe or behind the sofa will become their new favourite spot! You shouldn't be concerned if your new cat doesn't want to interact with the family much at first - but it's really important to ensure your new cat is brought into a safe environment, with the right equipment and supplies to keep it happy and healthy. This checklist provides some more insight into the essentials that you will need for your new furry friend. 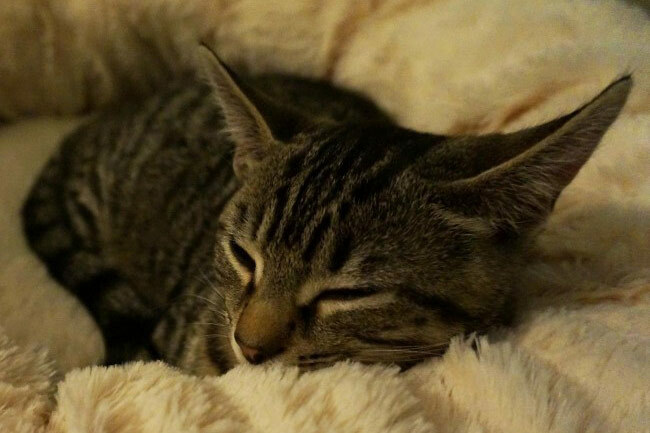 Cats love sleeping – it’s a fact. They love sleeping so much that they can do it for up to 20 hours per day! Usually, your cat will choose their own favourite spot to sleep, but it’s always important to provide them with a bed of their own too. Cats tend to avoid sleeping on the floor – unless it’s a warm day and they’ve found a nice patch of shade! Placing their bed on a sofa or low coffee table can encourage them to use it. But don’t be surprised if your cat decides that the arm of the sofa is a much more fun place to sleep than a bed! Me & My Pets Pro Tip: If you cat is shy, an igloo bed can offer the perfect combination of comfort and a hiding place. If your cat prefers to sprawl, a soft donut bed is ideal. These are also great for kittens – especially when you have more than one! Cats love to be fed at the same time every day. In fact, if you’re consistent with your feeding times then your cat will become so used to it that you’ll be able to set your watch by them! Use a rubber mat to protect the floor; some cats can be very messy when eating wet food. This grey non-slip rubber mat is perfect when paired with a twin feeding bowl. Your cat probably won’t drink much, but it’s important that they are provided with fresh, clean water at all times. A twin feeding bowl allows for fresh water and dry food to be available 24hrs a day. My & My Pets Pro Tip: Use a non-slip single bowl for wet food, and make sure you wash the bowls out after every meal. Cat food can become a breeding ground for bacteria very quickly, especially in the summer. You will need to keep your cat indoors for at least two weeks after it comes home. This is so it can learn where it lives, and to ensure that it returns home once you start letting it outside. Keeping a cat inside comes with one inevitability – the need for a litter tray. There are dozens of different types of cat litter available. Regardless of which one you choose, the most important thing is to change it regularly. Try to clear out faeces as soon as possible; cats are very clean animals and will try to avoid defecating on previously used areas. This can mean they end up hanging over the edge instead… and we don’t need to spell out the consequences! Cats will cover often flick litter after they have been to the toilet – this is completely natural, but it can make a terrible mess! They can also drag litter out of the tray when the step out, causing the area around a litter tray to become unhygienic and unsightly very quickly. Always place your litter tray on a litter tray mat – this will protect your flooring, and is specially designed to remove remnants of litter from your cats paws! Me & My Pets Pro Tip: Don’t forget, it’s just poo, so often the easiest way to dispose of it is by simply flushing it down the loo! It’s a universally accepted fact that cats don’t like going in their carriers. Independent and wary, they quite frankly don’t like going anywhere unless it’s under their own steam! But a carrier is essential for taking your cat on vet trips, and of course – bringing her home! You may be tempted to put your cat in the car without a carrier. Cats will often jump into a parked car when the door or window is open. They’re warm, dark and inviting! But it is never recommended to transport any unsecured animal in a car – the chance of accident or injury is too high. It may seem like your cat is happier being out of its carrier, but it is not worth the risk. Me & My Pets Pro Tip: We love this two-in-one fabric car seat and carrier. It’s more comfortable than a traditional plastic carrier. It also comes with side loops to thread a seat belt through – ensuring your cat companion is kept safe. Always choose a wipe clean carrier in case of any motion sickness or accidents! If you value your sofa, carpets, wallpaper, trouser legs or garden fence, then a scratching post or scratching toy is an absolute must-have for your cat. They love to scratch, and it’s important that they do. Scratching helps to remove the dead outer layer of their claws, it helps them to mark their territory, and it feels good! There are hundreds of different scratching posts available, but often the simplest are the best. Start your cat off with a simple scratching post with elevated platform. Using a scratching post made of sisal will be irresistible to your cat! You can use inexpensive carpet tiles to create an area near your cats’ bed. These have the added bonus of being easy to take outside and shake the hair off! Me & My Pets Pro Tip: If your cat is scratching at the walls and ruining your wallpaper, try protecting the wall with a corner scratcher. And for the ever-tortured side panel of the sofa, you can attach an inexpensive wall/floor scratch pad, to keep your soft furnishings safe from feline claws! Cats love to flex their hunting muscles by chasing toys. Some cats are calmer in their approach to play, but most won’t be able to resist a bouncy mouse or super fun play tunnel! Kittens are especially playful, and will spend most of their waking hours exploring, chasing and generally being full of life and energy! We find that kittens can’t get enough of this 3-way cat play tunnel – and it folds away for storage too. Me & My Pets Pro Tip: Remember that a cat will often have its claws out when playing. It’s not trying to hurt you, but it might do by accident. If you are worried about being scratched, don’t avoid playing with your cat. Instead, opt for toys which allow you to play at arms’ length, such as tunnels and fluffy mice on strings!